I got home yesterday after a nightmare exam and found this sitting on the kitchen table, so it was quite a treat. 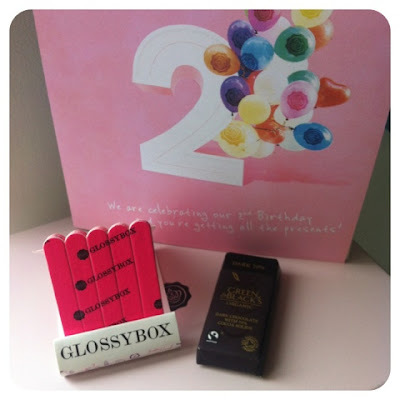 Its actually GlossyBox's 2nd Birthday!! 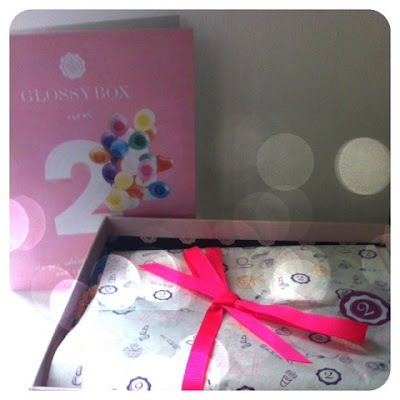 So Happy Birthday GlossyBox!! I loved the GlossyBox packaging in this box like usual, The cute little print on the paper of make up and especially the neon pink ribbon. There was a special little treat for everyone as it's GlossyBox's Birthday, These cute mini nail files, there's twenty in the pack and they're great for travelling with and even just popping in your handbag, I know I really should as I never have one handy. Plus if you've been subscribed to GlossyBox for more than a year they threw in a little Green and Black's chocolate which is always nice. 1) Collection Fast Stroke Eye liner in Black (£2.99 for 6ml) This is just one of those products I'm probably not going to use, Just for the fact that me and liquid liner don't agree, I'll try it and probably fail, But I have heard good things about this, so its probably a really good product if your into liquid liner and affordable too! 2) Beautiful Movements Cosmetics Prime & Create Mixing Medium (£20 for 20g) This actually used to be BM Cosmetics and I like quite a few of the other things GlossyBox has sent by them before. So not only am I excited for this due to that, but also because its multi purpose as a primer and mixing medium. 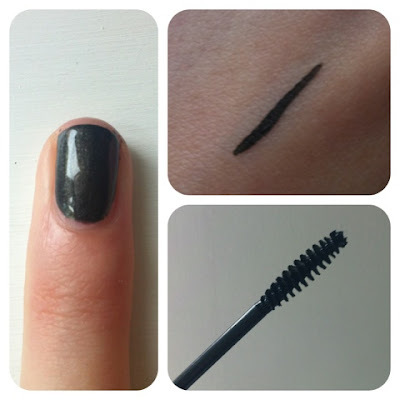 3) Jelly Pong Pong Fairy Lashes Mascara in Black (£15 for 8ml) I've heard quite a bit about this product, So I'd be super excited if I hadn't already got it. I still haven't tried the one I already have as I don't like opening new mascaras when I already have one open. 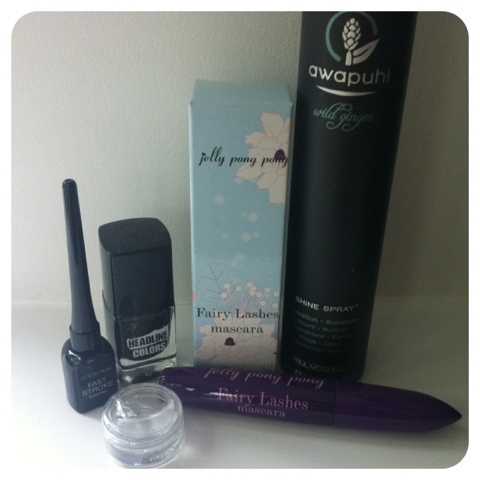 4) Awapuhi Wild Ginger Shine Spray by Paul Mitchell (£18.95 for 125ml) I got sent a shine spray in the February box, As much as I love Paul Mitchell, I just don't think its very easy to pull off the 'Shine' look with blonde hair. Plus I really cant stand ginger, Ill give it a go but I think this might just become a product I'm not going to use sadly. 5) Headline Colors Poolside Party Nail Polish in Gunmetal (£9 for 10ml) There is only one thing slightly wrong with this, Gunmetal isn't part of the Poolside Party Collection. Its part of the Autumn/Winter Collection, However I did want this one anyway so I guess it works out. Plus Headline Colours actually used to be Killer Colours by the way, I reviewed one here, Just so you can see how they are. Overall I like the products in this box, But most just aren't products I'm going to use, which is rather disappointing Maybe Ill grow to love the products in here but other than 2-3 products I'm just not too excited over it. But what is a ok box to me someone may love, I just think that last months box was definitely the best and should of been the Birthday Box. How do you like GlossyBox this month? Which has been your all time favourite GlossyBox? cost a pretty penny? I'm not very internet smart so I'm not 100% certain. What's up, after reading this remarkable piece of writing i am as well happy to share my experience here with colleagues.